The post Cardinal Health shares rise on FY2019 Q2 earnings beat appeared first on MassDevice. The post ReShape Lifesciences CEO Gladney to resign | Personnel Moves – January 29, 2019 appeared first on MassDevice. Cardinal Health has launched a supply chain automation solution that is designed to address the challenges in the operating room. The single health system-wide platform allows hospitals to streamline OR processes, reduce costs and improve efficiency with real-time inventory visibility and prescriptive analytics. The system also offers real-time insights and wrap-around logistics. The post Cardinal Health launches supply chain solution appeared first on MassDevice. Cardinal Health (NYSE:CAH) today posted fiscal first-quarter results that handily topped the average estimates on surging profits and confirmed its earnings outlook for the rest of fiscal 2019. The Dublin,Ohio-based healthcare giant reported profits of $593 million, or $1.94 per share, on sales of $35.21 billion for the three months ended Sept. 30, for a whopping bottom-line gain of 415.7% on sales growth of 7.9% compared with fiscal Q1 2018. Adjusted to exclude one-time items, earnings per share were $1.29, 21¢ ahead of the consensus on Wall Street, where analysts were looking for sales of $33.70 billion. Cardinal Health said it still expects to log adjusted EPS of $4.90 to $5.15 for fiscal 2019. First-quarter profits for Cardinal Health’s medical business rose 4.7% to $135 million on sales growth of 2.7$ to $3.80 billion. The company cited a beneficial year-on-year comparison on the fair-value step-up of inventory acquired when it paid $6 billion for Medtronic’s patient recovery business. CAH shares, which closed up 2.1% at $53.65 per share yesterday, gained 2.5% in pre-market activity today, rising to $55 even apiece. The post Cardinal Health’s fiscal Q1 tops estimates appeared first on MassDevice. Cardinal Health (NYSE:CAH) subsidiary Cordis said last Friday that it launched the Mynx Control vascular closure device intended for sealing 5-7 French femoral arterial access sites. The newly launched system is intended to reduce time to hemostasis and ambulation after diagnostic or interventional procedures, the Dublin, Ohio-based company said. The system also includes a next-generation deployment system designed to improve predictable deployment. “The notion of secure extravascular closure with nothing left behind is very appealing for a number of reasons. In addition to the clinical benefits of undisrupted flow in the artery, Mynx Control VCD minimizes technique-related issues and emphasizes simplicity and reproducibility,” Cordis global medical director Dr. Ali Almedhychy said in a prepared statement. Cordis said that the Mynx Control system also features a sheath catch that is compatible with procedural sheaths, a tension indicator for improved device positioning and sealant deployment and a simplified, ergonomic handle. The system uses a dual-mode active sealing mechanism that contours to the arterial wall and expands to fill the tissue tract, creating a matrix structure for clot formation, Cordis said. The components are made to be resorbed within 30 days. 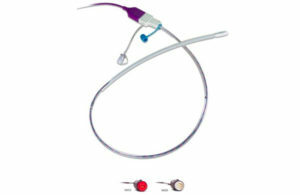 “Mynx Control VCD reinforces Cordis leadership in global vascular closure innovation. By adding new access, diagnostic, interventional and closure products to our portfolio, we continue to make significant patient-centric contributions to the delivery of healthcare,” Cordis prez Patrick Holt said in a press release. In May, Cordis won a date with an FDA panel looking to discuss the premarket approval application for its InCraft AAA stent graft system designed for treating infrarenal abdominal aortic aneurysms. The post Cardinal Health’s Cordis launches Mynx Control vascular closure system appeared first on MassDevice. NuVasive (NSDQ:NUVA) said today it named Medtronic (NYSE:MDT) surgical innovations prez J. Barry as its new CEO, replacing Gregory Lucier, effective November 5. Barry will also join the company’s board of directors, where Lucier will continue to serve as board chair and aid in transition efforts, the San Diego-based company said. NuVasive also said that it promoted current strategy, tech and corp dev exec VP Matt Link to president. Link has worked with NuVasive since 2006, holding numerous roles in the company primarily around building the US commercial organization. In his role with Medtronic, Barry leads the company’s second largest business with $5.5 billion in annual revenue, NuVasive said, leading more than 14,000 employees in 78 countries. Prior to joining Medtronic, Barry held commercial and leadership roles at Covidien. “On behalf of the board of directors, I want to thank Greg for his many contributions to NuVasive—first as a member of the board, and then as our chairman and CEO. Greg quickly shaped NuVasive into a global spine systems innovator, delivering highly differentiated technologies and procedurally integrated solutions to the market, improving patient outcomes by enabling better clinical decision-making and execution. We look forward to continuing to work with Greg, leveraging his business leadership and industry expertise as chairman of the board. Succession planning is one of the most important responsibilities for a board of directors of a publicly traded company, and we take those responsibilities seriously. Through our comprehensive recruitment efforts, we were impressed with Chris’s expertise in the medical device industry, and feel his strong reputation as a skilled and strategic operator, along with his innate passion and business know-how, will enable him to continue NuVasive’s transformation of spine surgery, adding tremendous value as he leads NuVasive into the future,” board lead independent director Don Rosenberg said in a press release. “Chris has successfully led teams globally, managed complex R&D programs, driven commercial initiatives and executed strategic acquisitions. He has built a stellar reputation for driving employee engagement and operational excellence. Through my personal and professional interactions with Chris, it is clear to me his leadership will benefit our surgeon partners, employees and shareholders. As a board member and shareholder, I have every confidence in Chris’s ability to take NuVasive to its next level of growth,” Lucier said in a prepared release. Cardinal Health (NYSE:CAH) said this week that it appointed Victor Crawford as its new pharmaceutical CEO. Prior to joining the Dublin, Ohio-based company, Crawford served as chief operating officer of healthcare, education and business dining for Aramark. “We are thrilled to welcome Victor to the organization as he brings a wealth of direct experience with many of our customers and clearly understands the complexities of global supply chain management in the healthcare arena. His strategic focus on customer relationships and in-depth knowledge of institutional management systems will help us build on the success of the various components of our pharmaceutical business including Specialty Solutions, Nuclear and Pharmaceutical Distribution,” Kaufmann said in a prepared statement. Bigfoot Biomedical said yesterday it named former Unilife (NSDQ:UNIS) COO Ian Hanson as its new chief technology officer and ex-Abbott (NYSE:ABT) exec Jyoti Palaniappan as its new chief commercial officer. Prior to joining Milpitas, Calif.-based Bigfoot, Hanson served as senior VP and COO of Unilife, leading development on their wearable injector platform and drug delivery systems. Prior to joining Unilife, he held positions with Medtronic’s diabetes business. “I’m very excited about the impact Bigfoot is going to have in this space. This team has a drive and energy that sets it apart, with the background and expertise to realize a category-defining vision,” Hanson said in a prepared statement. Palaniappan previously served 11 years with Abbott, leading the US commercial operations of its diabetes business. Prior to Abbott, he held positions at Thermo Fisher (NYSE:TMO) and consulted with McKinsey & Company, Bigfoot Biomedical said. “It is amazing to see over 100,000 people following Bigfoot on Facebook already, patiently waiting for Bigfoot products to launch. I am truly humbled and energized to join this passionate team who are working hard to get Bigfoot’s patient-centered designed, innovative products into the hands of people with insulin-requiring diabetes as quickly as possible,” Palaniappan said in a press release. “Ian and Jyoti bring with them an impressive depth of experience in drug delivery systems, device development, and health technology commercialization. I’m thrilled by what Jyoti and Ian will add to the Bigfoot team and eager to see them apply their tangible passion and deep expertise to our vision for an easier, safer, and better life for people with diabetes,” co-founder & CEO Jeffrey Brewer said in a prepared release. IRRAS said today that its senior VP of commercial operations and European GM Karl-Matthias Moehlmannhas left the company. The Stockholm-based company announced that its executive management team now consists of prez & CEO Kleanthis Xanthopoulos, CFO and deputy CEO Fredrik Alpsten, CCO Will Martin, product dev VP Lance Boling and human capital senior director Kellie Fontes. IRRAS said that its extended management group consists of product excellence VP Adam Sampson, product development senior director Dino De Cicco, regulatory & quality director Dessi Lyakov and finance VP Sabina Berlin. Clearside Biomedical (NSDQ:CLSD) said today it named Thomas Crawford as its new supply chain VP. Prior to joining Clearside, Crawford served as supply chain and customer service VP with Pharma Tech Industries, and has held various management positions with companies including Abbott, Allergan (NYSE:AGN), Aronex Pharma, Immucor, Shionogi and Zenith Goldline Pharma, the Alpharetta, Ga.-based company said. “Thomas brings an important depth of manufacturing operations and supply chain management experience to the company. Thomas will be in a position to provide seamless distribution management for suprachoroidal CLS-TA to many of our global testing sites and, if suprachoroidal CLS-TA is approved, in support of our commercial supply,” CEO & prez Daniel White said in a prepared statement. The post NuVasive taps Medtronic surgical innovation prez Barry as new CEO | Personnel Moves – October 19, 2018 appeared first on MassDevice. Cardinal Health (NYSE:CAH) subsidiary Cordis this week won a June date with an FDA panel looking to discuss the premarket approval application for its InCraft AAA stent graft system designed for treating infrarenal abdominal aortic aneurysms. On June 12, the FDA’s Medical Device Advisory Committee’s Circulatory Systems Devices Panel will meet to discuss possible marketing applications for the InCraft, which is currently under evaluation in the company’s Inspiration study. The Inspiration study has already met its primary safety and effectiveness endpoints, but reported a higher than anticipated rate of certain adverse events, according to an FDA release. In meeting, the FDA panel will explore “how these events impact the long-term safety and effectiveness, as well as the benefit/risk profile of the device,” according to the release. Shares in Cardinal Health have risen 5.1% so far today, at $55.47 as of 12:06 p.m. EDT. Last month, the US Court of Appeals for the Federal Circuit revived a stent patent infringement suit brought by Medinol against Cordis and its former parent company Johnson & Johnson (NYSE:JNJ). The post Cardinal Health’s Cordis wins date with FDA panel for Incraft AAA stent graft appeared first on MassDevice. A group of healthcare providers levied a purported class action against BD, its distributors and group purchasing organizations accusing them of running a monopoly on the U.S. safety syringe market. The suit names BD, Premier Inc. (NSDQ:PINC), Vizient, Cardinal Health (NYSE:CAH), Owens & Minor (NYSE:OMI), Henry Schein (NSDQ:HSIC) and “other unknown Becton distributors” as defendants. Providers are forced to buy BD safety products “or else face substantial economic punishment” due to the defendants’ “tremendous market power,” the suit alleged. “Defendants have profited greatly from the above-competitive pricing that they have charged for the relevant Becton products,” according to the complaint, filed by Marion Diagnostic Center, Marion HealthCare and Andron Medical Assoc. “Through their conspiracy, defendants have suppressed competition by preventing Becton’s rivals from obtaining sufficient market shares to bid Becton’s prices down to economically efficient, competitive levels. The conspiracy has also suppressed conventional and safety syringe innovation and safety, placing patients and healthcare workers at needless risk of serious infectious diseases spread by needlesticks and blood-borne pathogens,” the plaintiffs alleged. The lawsuit seeks a judgment that the defendants violated the Sherman Act, meaning the potential for triple damages, an injunction barring further conspiracy, pre-d and post-judgment interest and legal costs. The post Hospitals sue BD, distributors, GPOs over alleged safety syringe monopoly appeared first on MassDevice. Shares in Cardinal Health (NYSE:CAH) fell today after the medical device maker missed EPS expectations and posted shrinking sales in its fiscal year 2018 third quarter earnings release. The Dublin, Ohio-based company posted profits of $255 million, or 81¢ per share, on sales of $33.6 billion for the three months ended March 31, seeing the bottom-line shrink 33.1% while sales grew by 5.7% compared with the same period during the previous fiscal year. Adjusted to exclude one-time items, earnings per share were $1.39, just behind the $1.51 consensus on Wall Street, where analysts expected to see sales of $33.5 billion, which the company topped. “Our non-GAAP operating earnings came in largely as expected this quarter. However, our non-GAAP EPS was adversely affected by a significant negative change in our effective tax rate primarily associated with our Cordis business. Our team is moving aggressively to address our operational and supply chain issues at Cordis. Under the leadership of our new Medical Segment CEO, Jon Giacomin, we are implementing a series of initiatives to improve those operations and drive greater efficiencies. While these initiatives will take some time, we remain confident in the potential of this business and the value it provides to cardiovascular patients. We have an exceptional portfolio of assets, a tremendously talented and dedicated organization, and a critical position in the delivery of global healthcare. We look forward to building on this incredibly strong foundation to drive future performance and increase value for our shareholders,” CEO Mike Kaufmann said in a press release. Cardinal Health significantly lowered its fiscal year 2018 non-GAAP EPS outlook, down from between $5.25 and $5.50 to between $4.85 and $4.95. Shares in Cardinal Health have fallen 18.9% today, at $52.45 as of 3:03 p.m. EDT. In March, Cardinal Health warned investors about a mini-tender offer from TRC Capital to acquire 2 million CAH shares at about 5% below their market price. The post Cardinal Health down on shrinking profits, EPS miss in Q3 earnings appeared first on MassDevice.